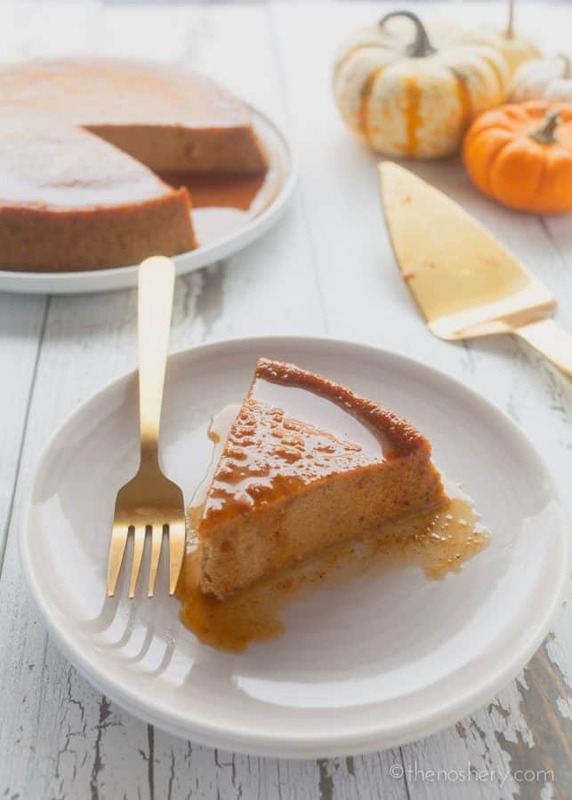 Pumpkin Flan | Nothing screams fall more than pumpkin and pumpkin spice! I know for some pumpkin spice can trigger a sigh or an eye roll but some of us love pumpkin spice. I love it and I’m not sorry. Fall is the start of harvest festivals and pre-holiday cheer. And, if you’re from a Latin home you know this is the start of flan season. Every party or family get together will have a flan on the table. Flan is the bomb; heck flan is magic! There are many different kinds of flan. Cheese, coconut, vanilla, rum, coffee, chocolate–you think of it, it’s probably been done. I gravitate toward cheese or coconut. But, since we are talking fall I made pumpkin flan. If you have never had flan before let me give you a quick lesson. There are a lot of things that make a flan delicious. The creamy texture, the caramel and for some of us it reminds us of home. Many things can make a flan delicious but, there are just as many things that can make it bad. Grainy texture or air pockets. I find that any flan using more than six eggs is going to be bad. I find that the magic egg number is five. If you see a recipe that calls for more than six eggs in one flan run in the opposite direction. WATCH YOUR CARAMEL! The moment you walk away from the stove I promise you it will over brown and burn. Also, you may be tempted to turn up the heat and hurry the process. DON’T DO IT! Be patience it will melt and it will be the perfect golden brown. Over stirring or working sugar while melting will cause it to crystallize. When melting the sugar keep stirring to a minimum. I like to periodically swirl the pot as the sugar melts, working the melted sugar on the outside in and sugar out to the sides. I then keep any whisking to the very end. This can happen from over whisking your batter. Whisking will incorporate air into your batter. I find it is better to use a paddle instead of a whisk. Also, cooking at too high a temperature can cause the custard to curdle and result in graininess. Cook your flan low and slow and DO NOT forget to cook it in a water bath. Skin happens from overcooking. As soon as you see your flan has set and stopped jiggling, pull it and let it cool. 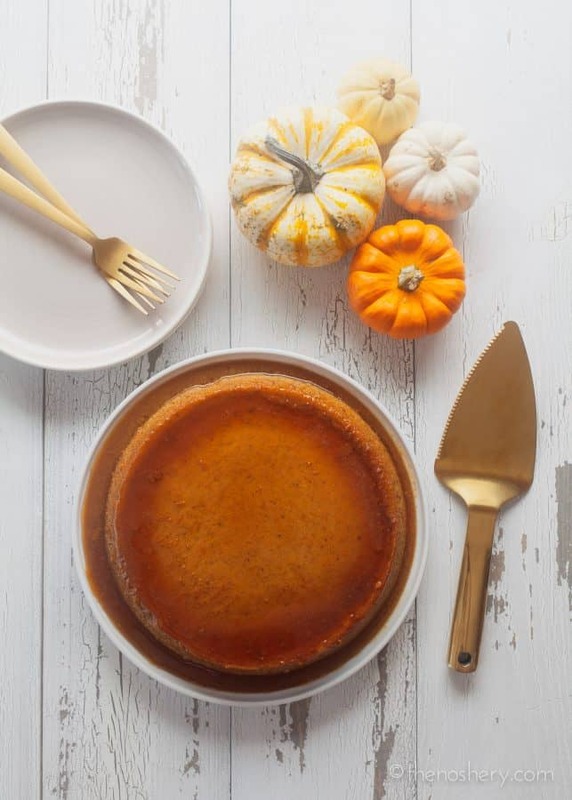 Pumpkin flan is a great addition to your Thanksgiving dessert table, and it can be made days ahead of time. Also, I have found that it satisfies pumpkin pie lover and non-lovers. It’s the perfect crowd pleaser. It has the creamy texture of a firm custard and the familiar, comforting taste of pumpkin pie! Mmmmm! Pumpkin pie step aside. Everthing that you love about flan, pumpkin, and pumpkin spice are combined to make this amazing dessert. Heat the sugar carefully in a heavy saucepan until it caramelizes. Pour the caramel into a round 8-inch pan; set aside. Beat the eggs lightly in a large bowl. Add the remaining ingredients and mix well. Pour the flan mixture into the caramelized saucepan. 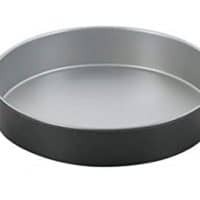 Place flan into a large roasting pan in the oven and pour water into the roasting pan outside of the cake pan until the water covers the flan half way. Bake for 1 hour or until set. Let flan cool on kitchen counter. Once cool to the touch refrigerate overnight to completely cool in pan. Run a knife along the edge of the pan and carefully invert onto a large rimmed platter. If you want to make individual flans use 2 cupcake pans. Pour caramel followed by flan mixture evenly in 14 molds. Bake in water bath at 350 for 45 mins - 1 hour, or until flans set. OMG OMG this is so goooood!!!! First time making it & its so good. Oooh….this looks yummy! 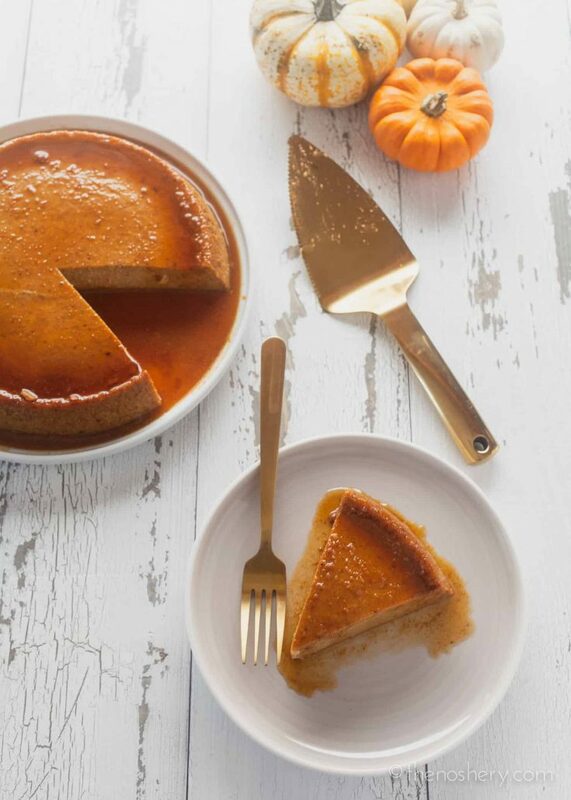 Pumpkin and flan…two faves combined….has got to be a winner! I am making it this week and taking it to someone’s house. I grew up watching my mom and grandmother caramelize sugar and I have done it before. Hopefully this will come off without a hitch. Pumpkin flan is a great suggestion and I’ll let you know how it goes. Yum! The pumpkin flan was a success!….almost. I didn’t bake it long enough because I was worried about over baking it. The center was runny. Molten pumpkin flan? My taste buds didn’t know the difference and the mistake is an easy one to fix. I live at 5280 feet so things take longer to bake. I will make it again. My friends thought it was really good. How do I unmold a flan made in a cupcake tray? How do I baño de maria and for how long when using a cupcake tray? I’ve never been a big fan of flan, but maybe I’ve just never had a good one. I’l need to give this a try and follow your tips! hahah when it comes to Thanksgiving I’m all about the sides and the desserts! Looks good! I totally agree with your traits of bad flan! Well, the skin one I can take it or leave it, mine tends to have one but it helps it from sliding right off the plate when I unmold it 😉 Making a good flan was quite challenging for me. The creamy custard without large air pockets was simple but learning to caramelize sugar was a hard one for me! Tried dry and wet methods. All didn’t go well, especially the wet ones. Can you say CRYSTALLIZED MESS?! Personally, I find 1/4 to 1/3 cup of sugar for a commonly sized flan is enough for the caramel, but not more than 1/2 cup. I’ve found recipes that called for a cup of sugar for an 8″ pan! To avoid crystallization, drop 3 drops of lemon or lime into sugar. I don’t know that I’ve ever actually had flan. but this looks so creamy and delicious so I’d definitely be up for trying it! Love your tips on avoiding a bad flan – I agree, bad flan is such a disappointment and a good one is divine! I’ve never tried flan for Thanksgiving. I love that idea, though!! Where will the flan be served? Love flan it is so delicious and pumpkin flan sounds just amazing. Looks fantastic – and great tips on making the perfect flan! 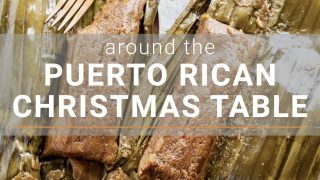 Definitely the same at our house – flan on every occasion (and then some)! 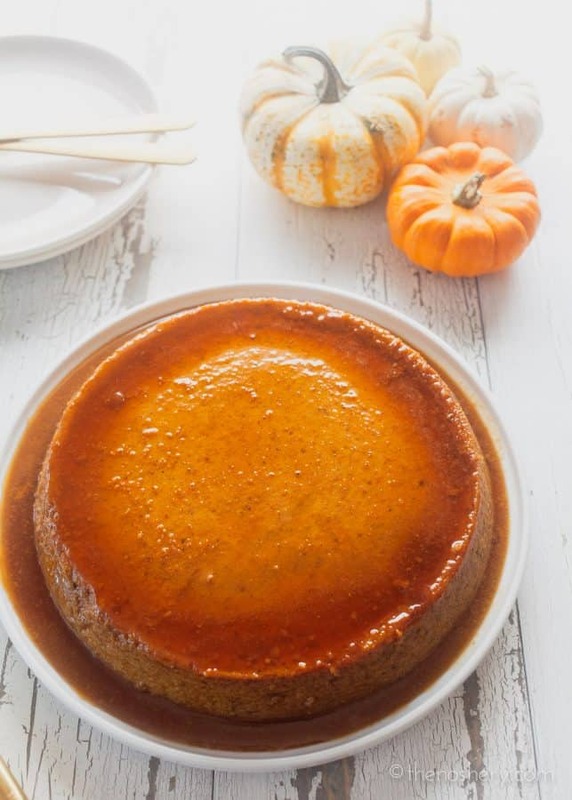 I like to make pumpkin flan for Thanksgiving, as well – yours is just gorgeous! What a beautiful addition to a holiday table. You have done a beautiful job on this flan. Flan is one of those under rated desserts! I love that this is pumpkin flavored! OMG! Pumpkin flan, this must be heaven!! I have to admit that I’ve never been a flan person, but this is such a pretty dessert. And that caramel…oh my! Your flan looks simply perfect! 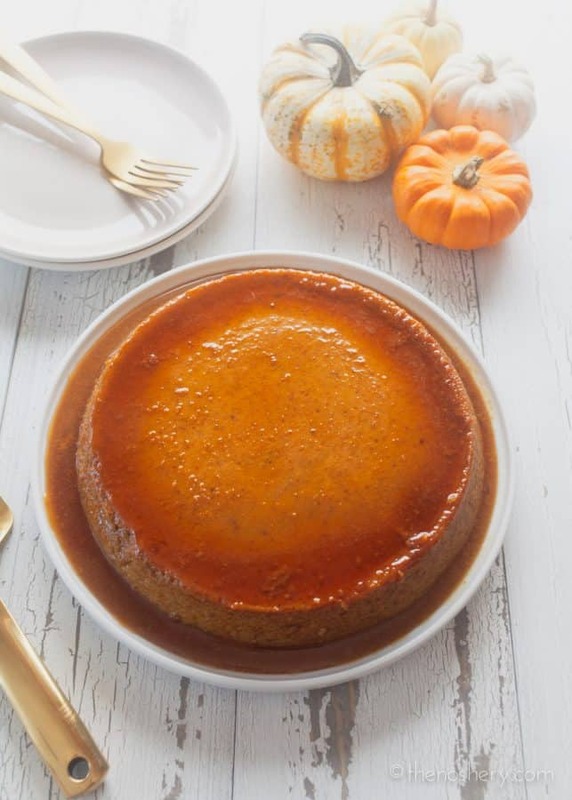 Love the idea of a pumpkin flan! Nice substitution for pie. It drives me nuts that too much of the caramel is left behind on the pan. Is there anything I could do?